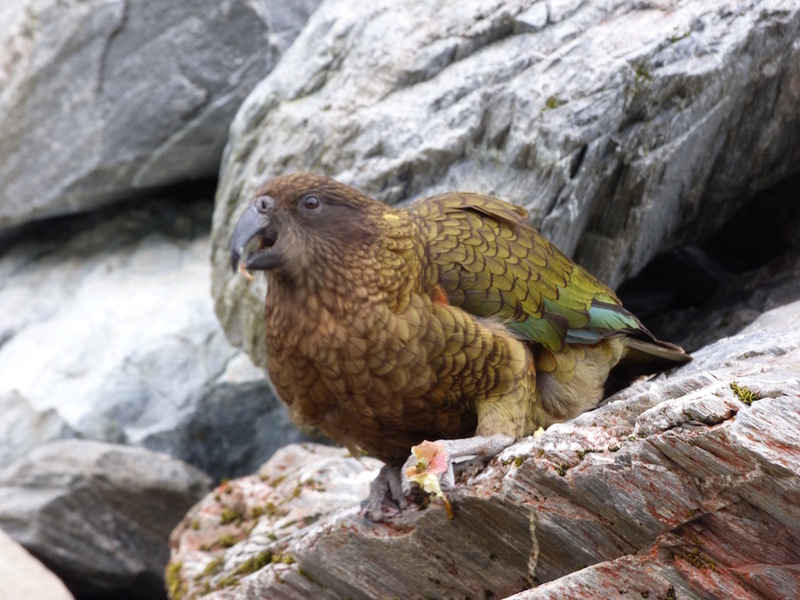 "Kea combine curiosity with calculated resourcefulness. 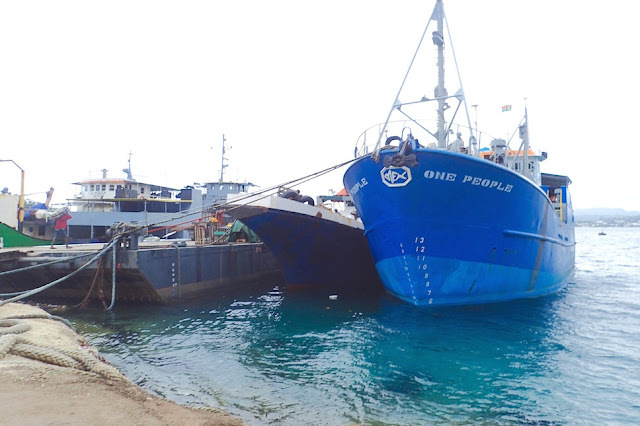 Once learned, they remember how to manipulate locks, draw back bolts and open doors to reach food…. The aviary kea throw stones to attract the keeper’s attention." 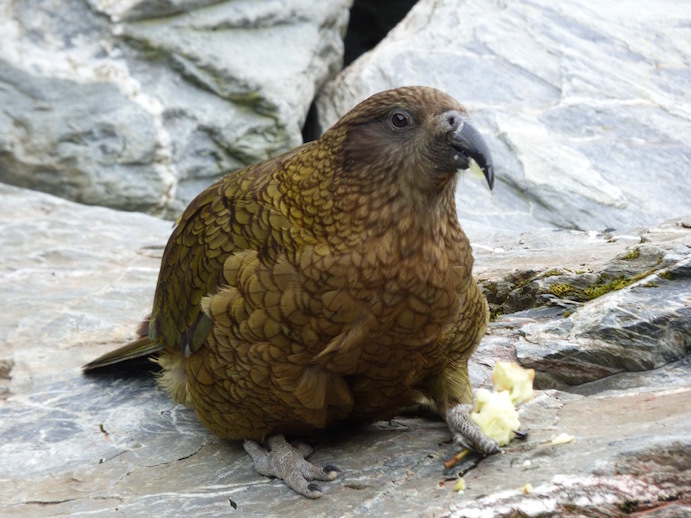 Mine, this kea seems to say, with apple-icious satisfaction. It was my birthday, and I’d just reached the trail’s end. I gazed up at what is left of the most crowded New Zealand outdoor attraction, Franz Josef Glacier. Honestly, considering the level of foot traffic popularity, I felt a little let down. Guess Glacier National Park in the US, particularly Iceberg Lake, spoiled me a bit. 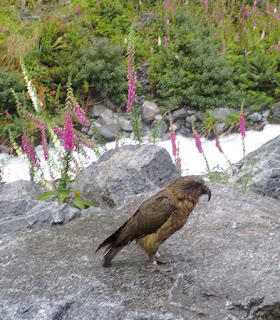 Apple gone, this kea was sussing out its next Franz Glacier target. Suddenly, a whir of wings descended. Their breadth seemed hawklike, as did the brown and white wing colors, accented with orange. Then the body -- a parrot sporting what looked like a middle-aged beer belly. Its body movements were equally gawky*, moving in waddles and hops. *Caught on video -- will add a short clip later. Awkward as it appeared, it was one canny bird. in hopes of more food. Quickly, it zeroed in on a woman eating and apple, and nabbed it. Off it hopped, relishing its “catch” with great gusto. 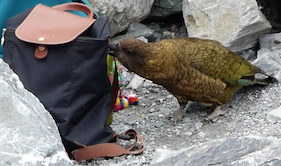 Next it tried to charm another hiker out of his lunch. No luck. Off it hopped to a pile of purses, pulling at one with its beak, to no avail. at The Chasm, Fiordland, Milford Sound. Convinced no further booty abounded, it took off. 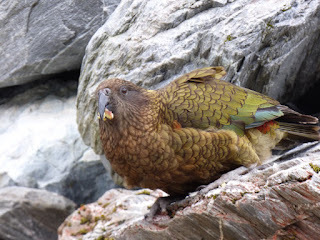 I’d met my first Mountain Kea. Its antics made my day. 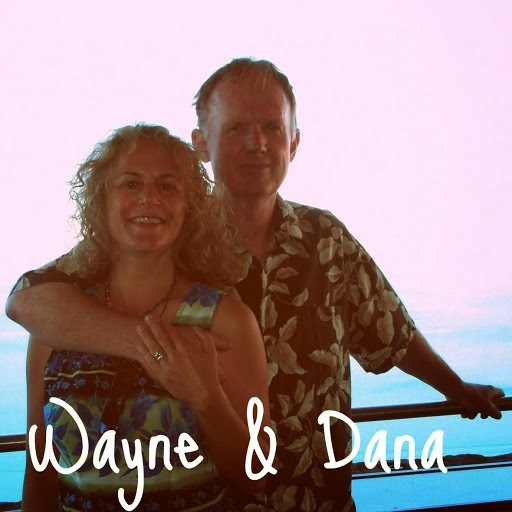 Fortunately, we discovered more since – or – rather they discovered us. 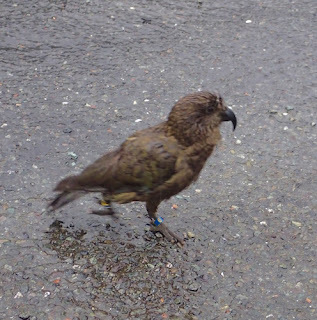 Despite the rain, in Milford Sound we were visited by Keas in two locations, both banded and numbered. The first was at the Chasm, where it literally ran across the parking lot to check out us and the other visitors. Unfortunately for that one, folks were more interested in taking photos than sharing food. about the rain as we were. 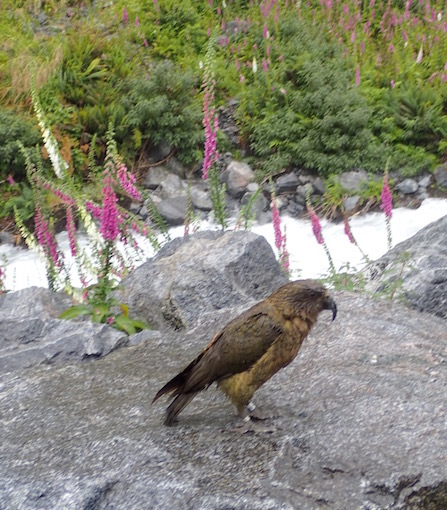 The second Milford Sound kea stopped by the same foxglove festooned alpine stream we did. This one was a bit luckier as Wayne’s a sucker for feathered fellas and despite the warnings, can’t resist sharing his food with them. 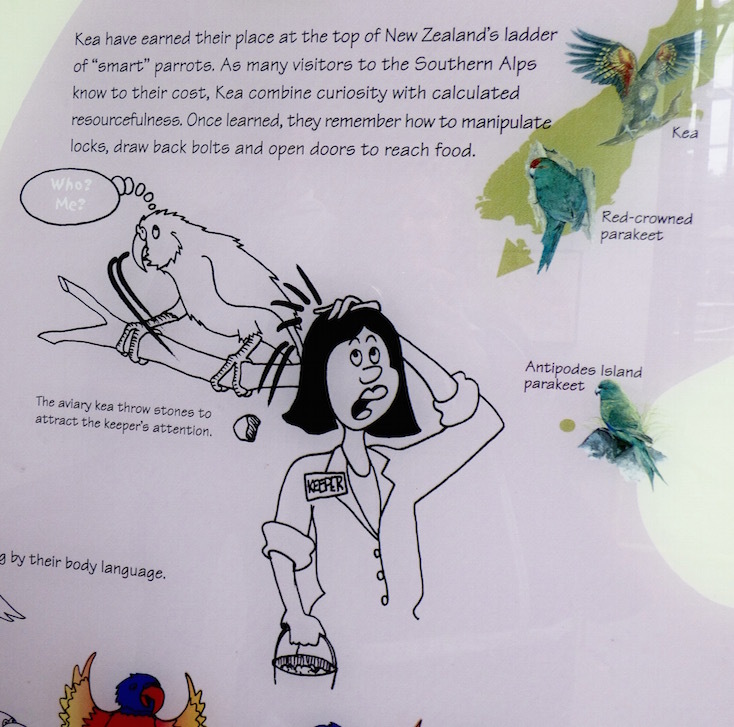 When we wandered through Invercargill’s Queens Park aviary, we weren’t surprised that the placard there extolled kea’s cleverness, calling them one of the smartest parrots. “Who me?” the cartoon kea said, next to the note that mischievous keas threw rocks at the keepers to catch their attention. at Invercargill to get her attention. This blog post was written about our New Zealand South Island late January road trip stops at Franz Josef Glacier in Milford Sound, Fiordland National Park and nearby Invercargill. We are currently just outside Christchurch in South Island, working our way back to our boat Whangarei Town Basin Marina, North Island, (S35.43.474 E174.19.599) targeting a February 8th arrival for a haul-out in Riverside Drive Marina.